For B2B companies, hitting your revenue number is still most impacted by whether or not your salespeople can articulate value in their customer conversations. And, great value conversations are a combination of superior stories to fuel the conversation, matched with remarkable skills to deliver that conversation. The best story, told the best, wins! We have developed stories and skills approaches – leveraging the decision-making sciences – we then apply to more than 100 companies each year, helping them develop their value story, and then training more 30,000 salespeople each year to tell a better value story. We believed this proven experience in story development and delivery skills would make for a good book. We’ve identified three ‘value moments of truth’ in every customer buying cycle. Create Value – where you need to help the prospect see the need for changing from their status quo and differentiates you from competitive alternatives during the differentiation phase of every buying cycle. Elevate Value – where you need to build a business case supporting a decision to change and invest, which must pass muster with executive and financial deciders during the justification phase of every buying cycle. Capture Value – where you need to protect your pricing premium and margins during the negotiation phase of every buying cycle. 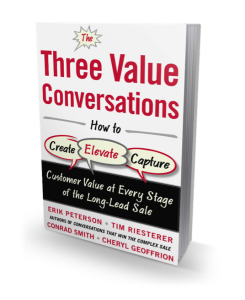 Readers will learn explicit concepts for developing and delivering a better value conversation at each key moment of the B2B buying cycle. Value is typically a complex, abstract idea, but this book makes it simple and concrete enough to build purposeful stories and learn practical enough skills to develop and deliver the best stories that win! A curious, journalistic-type that wants to make sure there is data and research to support the concepts being promoted and taught to marketing and salespeople. 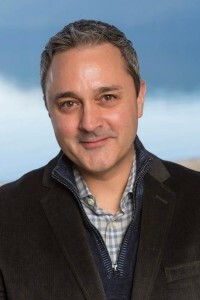 Specifically, when it comes to customer conversations, wanting to know, test and apply real science behind how buyer’s frame value and make choices – and replace the common unexamined folklore associated with so-called best practices that pervades many of the marketing and sales communications ideas being promoted today. Anything by the Freakonomics guys (Levitt and Dubner) for their unexpected, counter-intuitive findings and clever writings. Nobel prize-winning researcher and author, Daniel Kahneman’s Thinking Fast and Slow which was the pinnacle of his decades of research into the social psychology and behavioral economics behind how people make decisions. Also, Robert Cialdini’s Influence because he really laid the groundwork for the way everyone since thinks about the psychology of persuasion. I grew up in a very small, rural Wisconsin town (600 people); first generation college, but with a basic bachelor of arts degree from a pretty pedestrian, public state college. Not necessarily the accepted background for becoming a thought-leading researcher, consultant, trainer and published author and speaker on a topic such as the decision-making sciences. I love performing in musical theater. And, also performed and recorded as part of two different vocal quartets that did a little traveling and performing throughout my home state of Wisconsin. But, to be clear, I’m more of an entertainer than a polished musician. Our 2015 eBook on decision Making Science vs. Best Practices was recently awarded a silver medal by Top Sales World. It includes several of the original, counter-intuitive persuasion messaging studies we conducted with Dr. Zak Tormala, a published professor in the Stanford Graduate School of Business.